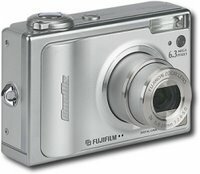 My new Fujifilm FinePix F10 digital camera finally arrived. :-) There was enough time to load the lithium battery and had it charged before I brought it to our Lion's Club Christmas dinner. There was no time to read through the user's manual, so I only took a few shots, just to try it. Moreover the memory card that came with it is only 16 MB - only big enough to store a few pictures. It is a 6.3 megapixel camera, so 16 MB is nothing. I am still in search of a good deal for a 512 MB or a 1 Gg memory card. I have looked around at ebay and there are some good deals there, even after the exhorbitant shipping and handling charges. I am also in search of a new card reader. The one I have right now doesn't take the xD picture card type. I hate having to spend more on an already expensive toy! :-( But I do not want to install the software that comes with the camera just so I can download the pictures, so I'll just have to get a new card reader. I know there are aspiring recording artistes out there that post their music online to be downloaded for free. While searching for more free MP3 downloads I came across a MSN-CNET site. On the site are listed various countries and from each country you can download whatever free music that suits your fancy .. from little known artistes of course. I started downloading a few songs from Malaysia, listened to them, and decided I liked them. So I started looking at those from Indonesia and Singapore too. Now I have enough music to burn on 2 audio CDs. Generally, the music composed are not all that bad. Well, except for the recording quality of some. Actually I think the groups or soloists who post their music on this site are quite talented. They just need a break. One Malaysian guy's instrumental music was quite good ... to my untrained ear, of course, heheh. His music sort of reminded me of Yanni. That gets me to thinking. I wonder if Vynne, Simon, Nixon and Jawi have thought about posting their songs to a site like MSN-CNET? I did download their free music from rumahdayak. Their vocal quality needs a little more polish, but it's a good start. Every aspiring artiste needs some kind of exposure .. even if he/she has to give his/her music for free. I have been downloading music from the internet ever since the hey day of Napster. You can just imagine how slow going it was back then with my dial-up connection. And recently I downloaded some Iban music ( shh, some were illegally fromatted!) as well as Malay and Hindi tunes. So I was thinking, since I don't have an MP3 player and can only play these music while I am on my computer, why don't I go and buy myself a player that has a CD-R/RW playback? 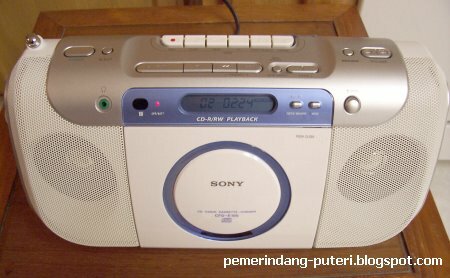 Hehehe, I was at K-Mart last night and I saw this little player (see pic) that had a CD-R/RW playback. I didn't know if it played MP3 straight or not. So as soon as I got home I got busy and started copying my music files onto CD-R discs. I used Media Player to burn them on the CD, and that was when I noticed that the CD was converted into an audio CD which could be played in any standard CD player, DVD player or CD drive on my computer! Heheh, I didn't need my new player to play those discs! But that's ok, because the new player I bought, which has a radio and cassette player, is quite compact and I can carry it around and play my newly burned discs without having to sit near my computer to listen to them. Moreover right now, one of my favorite FM stations has started playing all Christmas songs 24/7 on the air! Now that has really helped in getting me in the festive mood. 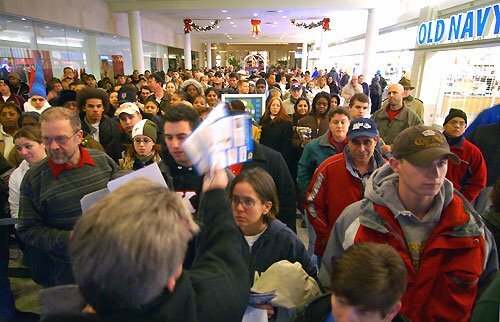 The day after Thanksgiving is known as Black Friday. It is so called because most retail stores go in the "black" for the first time in the year. It is also the traditional start of the holiday shopping season. Most of the big stores open their doors at 5.00 a.m. and usually by that time there is already a long line at the door. I did not bother to go to the stores that early today. The thought did cross my mind, though, because I was awake at 4.30 a.m. to answer the cries of one of my kids. At Walmart, you can get a laptop for under $400. I read somewhere that there was some trampling going on at a Walmart store for the laptop. :-) There are only so many laptops that each store carries, so I can understand the desire to be among the first to get into the store! I did go to JoAnn, my favourite craft and fabric store. I got there just before 9.00 a.m. and boy was there a crowd there! I got myself some fabric for a children's quilt and also some jewelry making supplies. All those were 40% off their normal price. I had to get a number at the cutting table (for the fabric), and after that I had to join the long line to the check out counters. Doug went to Best Buy to look for a memory card for my new digital camera, but there was none in stock for the one I wanted. My parents-in-law left before 8.00 a.m. for Best Buy and they got themselves, among other things, a radio. I guess I'll do most of my christmas shopping online this year. I need to go back to Amazon.com to look over my wish list. Other then upgrades for my camera and computer, I can't think of anything else I have to have. 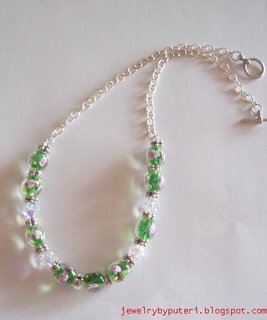 I used lampwork flower glass beads and swarovski crystals on this necklace. The chain is sterling silver plated and the spacer beads are just plain silver colored metal beads. 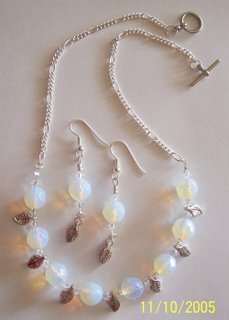 I made this necklace the same time I made the moonstone necklace. It's turkey day! :-) Got up at a reasonable hour this morning so I could get started with my roast turkey preparations. I chopped up celery, chestnuts, day old bread for the crumbs, sage, smoked bacon, dried apricots, and added salt, pepper, pinch of nutmeg, and an egg to the mixture. That is the stuffing for the turkey! I then put all that mixture under the skin of the turkey in the breast area, and added rolled bacon, garlic and rosemary in holes in the thigh and legs. After that I rubbed the turkey with olive oil, salt and pepper and it was ready for the oven. I was supposed to bake the turkey 18 minutes for every pound of the bird. I gave myself an additional half hour but when the three and half hours were over, the bird was not quite ready. :-( I put the meat thermometer in, and the temperature only came up to 160 F. The internal temperature was supposed to reach 180 F. So in it went back into the oven. I even turned up the temperature of the oven so it'll cook faster. Heheh. Anyway, the turkey turned out really nice and it also tasted just as great! Yummy! We had green bean casserole, mashed potatoes, corn, cranberry sauce, and gravy made out of the drippings of the roasted turkey. Simply delicious! :-) And we drank sparkling cider with the meal. You can make the stuffing a day or two in advance to help lighten the load on Thanksgiving Day. Finely chop the celery, shallots, sage, and pancetta and add with butter to a hot frying/sauté pan. Fry gently on medium heat until everything is lightly golden brown. Take off the heat. To prepare the fresh breadcrumbs, take a loaf of day-old bread, remove the crust and place the chunks of bread in a food processor until the bread is coarsely chopped. Add the breadcrumbs and coarsely chopped apricots and chestnuts to the celery, shallots, sage, pancetta and butter mixture. Season well to taste with salt and pepper. Mix well and chill. When the stuffing is cold, add the pork, nutmeg, and egg. Refrigerate until ready to use. The big problem with cooking turkey is that the legs take longer to cook than the breasts. This means the breasts dry out in the oven waiting for the legs to catch up. In this recipe, I push sage and apricot stuffing up under the turkey breast skin, increasing the thickness of the breasts so they take the same time to cook as the legs. The result? Juicy turkey all round! Some people brine the turkey, some people don't. Personally, I like to rub the turkey with table salt inside and out and put it in a clean plastic bag and refrigerate it overnight (12 to 24 hours). This removes all the excess moisture and allows it to cook beautifully. Preheat the oven to 350ºF. To prep the turkey, rub it with salt inside and out 12 to 24 hours before cooking; table salt is fine. Store the salted turkey in a plastic bag and refrigerate. When ready to cook, rinse or wipe off excess salt. Pat it dry with paper towels and place on a board. Make a bed of roughly chopped shallots, 6 unpeeled garlic cloves, and carrots in your roasting pan to act as a rack. Slice the strips of pancetta in half and slice the peeled garlic into thin slivers. Place a rosemary sprig and a garlic sliver on one end of a strip of pancetta and roll it up tightly. Repeat with the other pieces of pancetta until you have 12 little rolls. Stab the thighs and drumsticks of the turkey in 6 places on each side. Push your finger into each slit to create a gap. Place each pancetta roll into the holes until it just peeps out. Find the edge of the skin at the turkey neck and with a rubber spatula or large spoon separate the skin from breast meat so that you can put the stuffing under the skin of the turkey breast. If you're careful you should be able to separate all the skin from the meat, keeping it attached at the sides but without ripping any holes in it. From the neck end of the turkey, spoon the stuffing up between the skin and the breast, tucking the flap of skin underneath to stop any leaking out during cooking. Microwave the orange for 30 to 60 seconds to get it nice and hot. Poke a hole in the hot orange and stuff it into the turkey cavity. You can also add some rosemary to the cavity. Place the bird in roasting pan filled with the vegetables, season well with salt and pepper, and rub olive oil all over. Weigh the stuffed bird, cover with foil, and roast for 18 minutes per pound, or until the juices run clear from the thigh if pierced with a knife or a skewer. Remove foil for the last 45 minutes to brown the bird. Remove the turkey and rest on a board for 20 minutes. Remove most of the fat from the roasting pan. Mash the roast vegetables right in the pan with a potato masher. Add the flour, sherry and stock and bring to a boil on a high heat. When the gravy thickens, strain into a bowl. Serve the turkey with the gravy. Two nights ago, Doug and I watched two Harold Lloyd movies back to back on TCM channel. I don't remember the last time I watched a silent movie (that would be a Charlie Chaplin film) so it was quite refreshing to watch two silent movies starring Harold Lloyd. I have not heard of Harold Lloyd nor watched any of his film prior to this, and I can say with conviction that he was quite an actor and comedian. The two films we watched were Grandma's Boy and The Freshman. They were really funny. Each of the film was only an hour long. No dialogue was needed because the acting was so good that we knew exactly what the actors wanted to say. Yeah, the dialogue screen that appeared between the scenes helped too. Hehehe. I look forward to watching more Harold Lloyd movies. I am sure I will be quite entertained. Grate potatoes and soak in olive oil. Apply on dry, cracked hands. Leave this on for 10 minutes and then rinse off. That is only one of the remedies that I found on the internet for dry cracked hands. The more amusing one. :-) I have dry cracked hands, and on the knuckles not only is the skin cracked, it is also bleeding. :-( I seem to have a serious case of dry hands this year. My palms feel rough and the skin is peeling. I have tried applying lotion, and oil, but the relief is short-lived. I should try applying petroleum jelly. Come to think of it, one of my friends gets dry cracked and bleeding hands whenever she eats raisins. She applied petroleum jelly on her hands and it healed her bleeding hands. Why didn't I think of this before? On my last doctor's visit (for a bad cough) I asked the doctor about my itching skin which I've had since July. She thinks that the itching is an effect of dry skin and told me to use a humidifier in my bedroom. And when applying lotion or oil, do it immediately after a bath/shower when the skin is still damp. She says that is the only time the skin effectively absorbs the lotion or oil. Also according to her, any application of lotion or oil when the skin is already dry is a pointless exercise. I have a humidifier but have not used it at all this year. I guess it is time that I use it. It may really help my condition! I got my 10 lb frozen turkey last night. I was not sure how quickly a frozen turkey would thaw and didn't want to be stuck with a still frozen turkey by Wednesday morning, so I thought I'd better give myself plenty of time. I wanted to get all the ingredients needed for the stuffing and for the roast turkey the same time I got the turkey last night but forgot to bring my recipe. *sigh* I was supposed to get rosemary and sage but instead I got thyme. I still have time to get the rest of the things though. I got the chestnuts but still need to get the dried apricots. 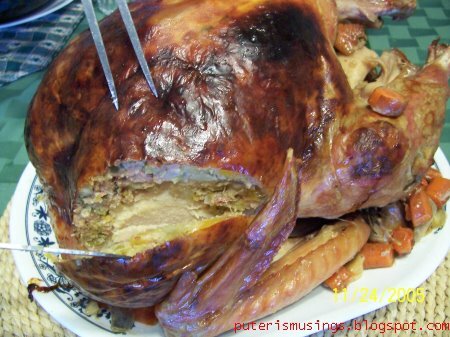 Here's Jamie Oliver's roast turkey recipe, and the picture at left shows what Jamie's roast turkey looked like. 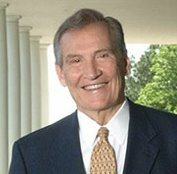 I am saddened to read today of the passing of well-known Baptist preacher, Adrian Rogers. I first heard of Adrian Rogers on his radio program, Love Worth Finding. Occasionally I would catch him on Christian TV. Pastor Rogers died on Tuesday, at age 74, after developing pneumonia from cancer treatment. There are many Christian programs on the radio and on TV but few that are really deep in the teaching of the Word. Adrian Rogers' program is solid when it comes to teaching Christian orthodoxy. Here's a portion of the statement issued by his family. Although we had all maintained hope up to the very end for a miraculous restoration of his health, we are comforted in the knowledge that he is now resting in the presence of his Lord and Savior to whom he dedicated his life and ministry on this earth. We cling to the assurance of God’s grace, as He, in His infinite wisdom, has determined the right timing of his homecoming. I like the quotes from Pastor Rogers about being in a "win-win" situation. Spoken like a true saint. EVERY year, World Diabetes Day falls on November 14. World Diabetes Day was established by the International Diabetes Federation (IDF) and World Health Organization (WHO) in 1991, with the aim of coordinating diabetes advocacy worldwide. It has become the primary awareness campaign of the global diabetes community. Diabetes runs in my family. My father has just been released from a one week's stay at the hospital after suffering complications from diabetes. I had gestational diabetes when I was pregnant. The chances of getting diabetes later in life is a distinct possibility for persons who have had gestational diabetes, and for me with a family history of diabetes, it is more a matter of when than if. My father attends regular diabetic clinic at the Polyclinic in Miri, Malaysia and after each visit he'd come home with a month's supply of medication. The only problem I have with the diabetic care in Malaysia run by the government hospitals is that the patients are not very well informed about the management of their disease. My father did not even possess a glucose meter. He took his insulin as told, but he never monitored his glucose level or his diet. Ever since he started injecting himself with insulin, his health seemed to have deteriorated. The only conclusion I can gather as to why, is that his insulin intake was not sufficient to treat his glucose level. That was how he ended up in hospital recently. His glucose level was sky high, beyond what the glucose meter could read! Now that my father is back home and after experiencing a near death experience, he'd be more careful about monitoring his glucose level and watching his diet. One of my brothers bought him a glucose meter, and we will make sure that he takes his glucose reading a few times a day. One of my father's biggest problem is that he is not prepared to spend as much as he has to to manage his diabetes. He can afford to spend the money on test strips and lancets for the glucose meter, but balked at the daily expense! I suppose now he cannot afford not to spend some money if he is to manage his diabetes well. When I had my gestational diabetes, I had to visit the endocrinologist about twice a week for several weeks, and then also I had to visit a nutritionist who taught me how to manage my diabetes through diet. At one point, I was told to take insulin because my glucose level seemed to be high too many times in a week, but I chose to control my glucose level through a stricter diet. When I think about how I was taught to manage my diabetes, I am amazed that my father who has had diabetes for years and years now, was not made to go through the same thing. Sure, he was told to avoid certain kinds of foods but he was not encouraged to monitor the glucose level daily using a simple gadget like a glucose meter. With the yearly observance of World Diabetes Day in Malaysia, I hope that more people will pay greater attention to the dangers and treatment of the disease. It appears that diabetes is on the increase in Malaysia, and as such greater education on the management of the disease is needed. 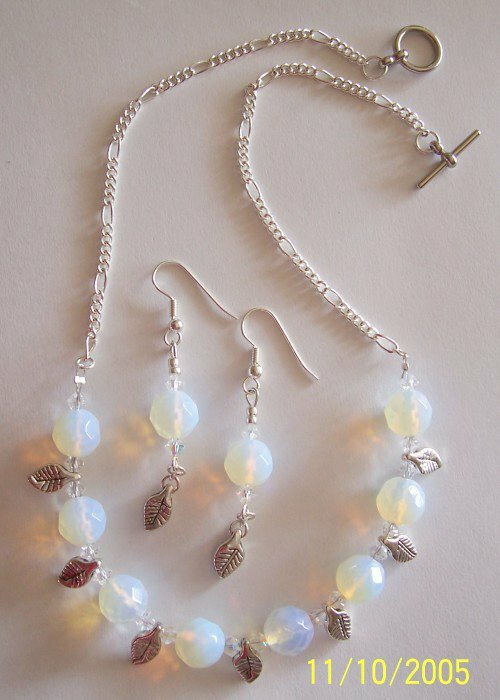 Look at the beauty of the moonstones! :-) I love the translucent quality of the stone. I have done a few necklaces now with silver chains, and using chains in a necklace make the necklace look dainty. In about 2 weeks we'll be celebrating Thanksgiving. This year, I will be hosting a Thanksgiving meal at my home. I have invited my in-laws, and nephew to this Thanksgiving dinner. Last year I saw a special on the Today show on NBC. The show had celebrity chef, Jamie Oliver, give a class in preparing a Thanksgiving meal. I was quite impressed by Jamie Oliver's turkey recipe and thought that I would be able to do it too. Ta da! I found the link to the show on the MSNBC site along with videos of the show where Jamie showed the Today show cast how to prepare the thanksgiving meal. I have watched the turkey recipe video over and over, and I believe I am ready for my first roast turkey! Heheheh. But I'll be sure to have other food on standby in case the turkey turns out to be a flop! Being foreign born, the celebration of Thanksgiving is quite foreign to me. Sure, I'd heard of the celebration before, but didn't realize how big a celebration it is in this country. It is a pity that there is a moving away from the real history of Thanksgiving. Secularists have attempted to dumb down the roots of Thanksgiving. So I'd like to take this opportunity to share with everyone the real story of Thanksgiving. Here's a link to The True Thanksgiving. The little Asian female radiologic technologist was very friendly and she made the whole experience bearable. Four x-rays were taken and on the last one, I had this expressive look on my face - tongue out, eyes crossed - which really amused the technologist. What else could I do? 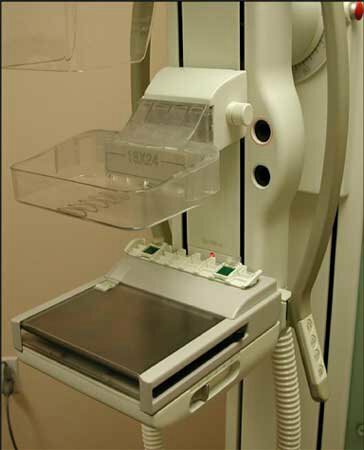 Something was being compressed, and anyone who says a mammogram is enjoyable, must be a masochist. But one redeeming thing about the experience is that it is quick, not drawn out. Twenty minutes and I was out of there, and that included the waiting time. I just hope that when the results are out, it won't be news that I do not want to hear. This method of breast cancer screening is not 100% accurate. Sometimes, a false-positive result is obtained. Who wants to hear a result that is not all clear even if it turns out to be false-positive? Just think of the anxiety and fear that arise while waiting for confirmation to see if the result is truly negative. Shudder. For now, a mammogram seems to be the most reliable method for breast cancer detection. I urge all women to do self breast exam at least once a month and a mammography at least once in 4 years. Two friends of mine have died of breast cancer while in their 40s. :-( Anyone with a family history of breast cancer should take the availability of mammography seriously. Early detection and treatment increase the survival rate tremendously. 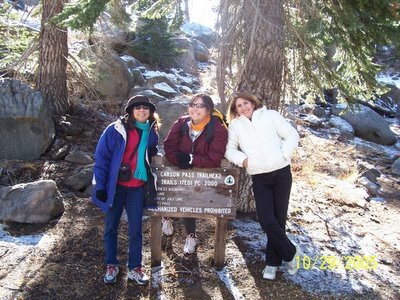 Last weekend, Rhea, Kathy, Karen (friends from church) and I, went to Kirkwood for a weekend retreat. Kirkwood is located in the Sierra mountains at an elevation of 7, 800 feet. There were remnants of snow in the mountains because 2 days before, it had snowed there. We arrived at the condo in Kirkwood late Friday night because Kathy forgot the keys to the condo and only realized it about 31 miles before we reached our destination! :-) We turned back to the closest restaurant/bar that had a phone that we could use. The bar-tender was an older man, and there were girlie pictures lined on the shelves behind him. He let us use the phone and Kathy and Rhea kept putting dollars on the bar, because he hinted that we could pay him with kisses if we didn't have enough dollars! After breakfast on Saturday morning we drove a few miles to the entrance of a hiking trail. The trail was called Carson Pass Trail situated in the Eldorado National Forest. The forest was beautiful, and the smell of fresh pine was invigorating! I was totally out of shape and panted most of the way up the trail. 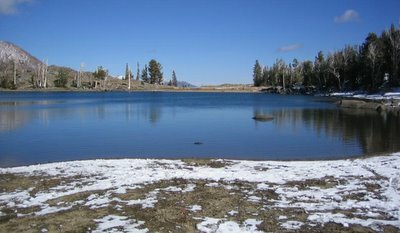 :-) We took a little detour off the trail to look at Frog Lake. We took about 3 hours 20 minutes to complete our hike. Karen and Kathy went further than Rhea and I. That night I felt my leg muscles ache from the workout that I gave them earlier in the day. 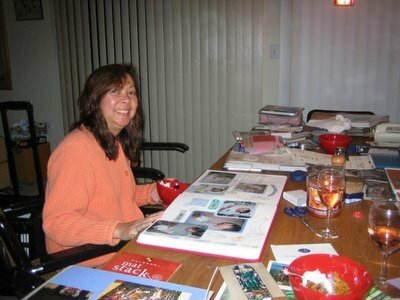 After spaghetti dinner, Kathy and I did some scrap booking while Karen and Rhea watched Casablanca. After a couple of hours of scrap booking, I gave up and watched The Incredibles. The Incredibles is a really fun movie! I thoroughly enjoyed it. My first scrapbook. 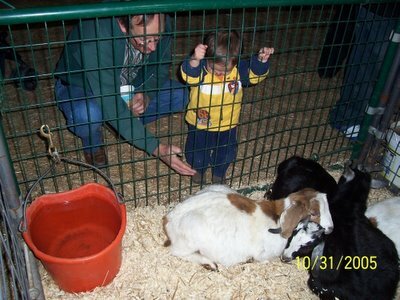 I started with Duncan's first year. On Sunday, after a short worship time, clean up and laundry, Karen, Kathy and I took a walk on the grounds of Kirkwood. Kirkwood is more a skiing resort than anything else. It is really beautiful there with the mountains in the background. We hope to go back to Kirkwood in the spring for another retreat. According to Kathy the hiking trails are beautiful in the spring with wild flowers every where. Last night, October 31, was Halloween. My church held its annual Harvest Carnival in lieu of Halloween. 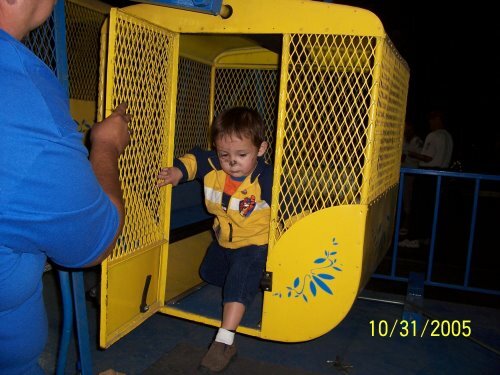 Last night was the first time I attended the carnival and we brought our young children to it. The carnival was a big thing for the church and it was open to everyone who lived in the city of Galt. It was well attended and I enjoyed watching the children participate in the games, the rides, the petting zoo, and the pony rides. Duncan got to ride in a little ferris wheel. Denice was too afraid to ride in it. 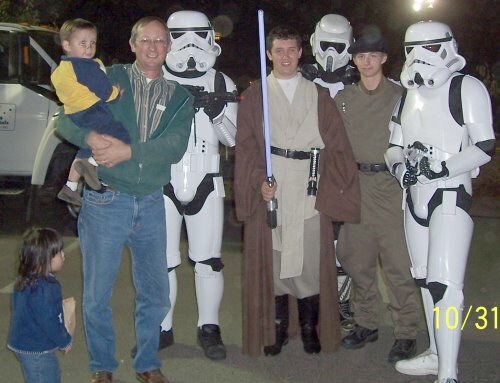 There was also free food and drinks and lots of candy for the kids.